You know what a pain it is to dry your daughter hair afterward when it’s partially or totally wet, then comb her hair, style her hair, and so on. Every single ordinary swim cap (without exception) is designed to press against your child’s head. Check out any high-brand swim cap. Just look at it and imagine how it would work when placed on a head. The more hair your junior has – the harder the pressure on their head. This LOOSEFIT DESIGN is based on an unparalleled principle – we divide the functions. One part of the cap FITS a head, while the other part leaves hair LOOSE. It doesn’t touch the head – so it doesn’t press against it. Imagine a headband and the way you put it on. That’s the feeling your kid will have with our Swim Cap. 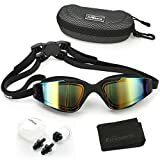 It’s made from the tough silicone material, which is stretchable, durable, soft, and comfortable (unlike Lycra), and it will last for a long period of time. A wonderful gift for your child, your friend’s kid, or your niece who is fond of going swimming, indoors or out. 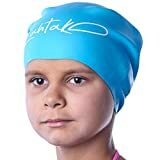 KIDS LONG HAIR SWIM CAP Our Lahtak Extra Large Swim Cap is a bestselling swimming cap for long hair. It has proven its efficiency for thousands of happy customers. With smaller M and S sizes we extend its high quality to kids, teens, juniors with long hair, braids or dreadlocks. DRY HAIR IS THE GOAL. 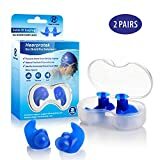 Although no swim cap KEEPS HAIR DRY 100% of the time, proper use of Lahtak Kid’s Swim Caps for long hair can help you achieve this MOST OF THE TIME. You can ADJUST the TIGHTNESS by squeezing air out of the cap and getting a perfect seal. LARGE SPACE for HAIR to fit COMFORTABLY. The size is Medium or Small – for long-haired kids, girls, boys, teens and for men & women with moderately long hair and curly braids,locks or dreadlocks.